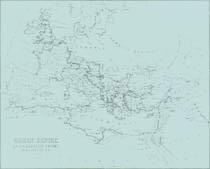 Clicking anywhere on this map will give you a more detailed look at that portion of the Roman Empire; as a guideline, the map above is divided into nine relatively equal segments which overlap somewhat in case you click near the border of a portion. The detailed maps will allow you to select segments for even greater detail. The detailed maps at both levels vary somewhat in size, depending on the complexity of the images displayed; the average is about 50K- 60K, but the range is 24K - 103K. With reasonably fast connections, most images should appear completely in less than a minute. A larger version of the map above (148K and about the size of a 14" or 15" monitor [make your browser window as large as possible]) is also available. The largest version of the map above available here (314K) will require a 17" monitor or larger at high resolution (1280 x1024, but on a 17" monitor details are not particularly readable) if the entire empire is to be seen at once; it is included for viewers who have the required monitors and/or do not mind waiting a considerable time for download or scrolling to see different parts of the empire. 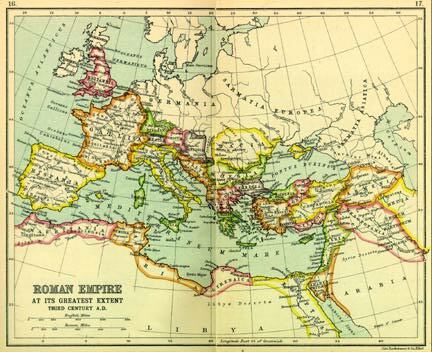 Note: Though this map states that the Roman Empire was at its greatest extent in the third century A.D., Mesopotamia, shown here as part of the empire, was only briefly part of the Roman world during the last years of the reign of Trajan (emperor A.D. 98-117) and was abandoned immediately after his death by Hadrian. The boundary was frequently, almost constantly, in dispute, but the northwestern portion of Mesopotamia on this map was usually in Roman hands. 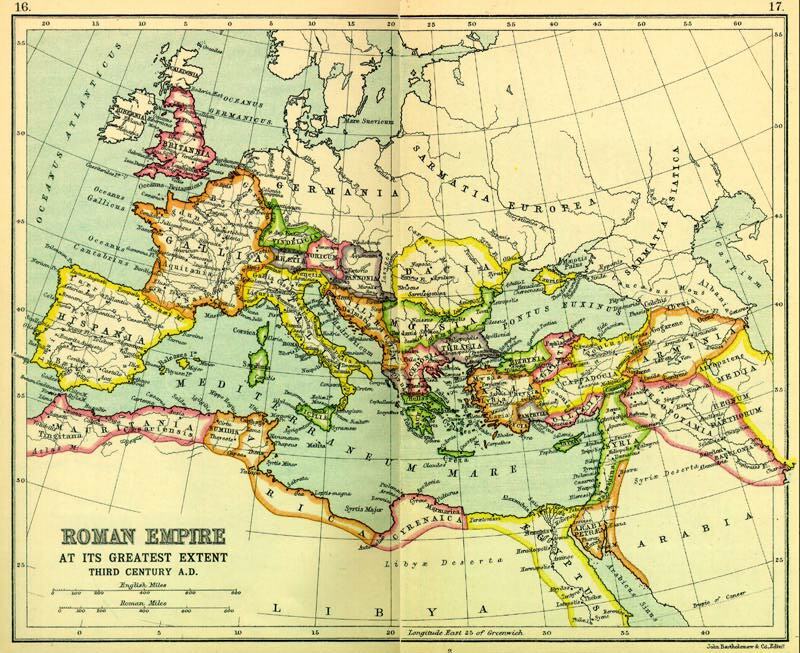 This map of the Roman Empire was scanned from pages 16 & 17 of a 1925 reprint of the 1907 Atlas of Ancient and Classical Geography in the Everyman Library, published by J.M. Dent & Sons Ltd. and is, by Canadian copyright law, in the public domain, to the best of my knowledge. The original scan was done at 300 dpi in 24 bit colour, resulting in a very large file of uncompressed data and 1.1 MB as a compressed JPEG file. I have edited the image to remove the blank margins of the two pages (some remnants of that process inevitably remain). During the preparation of the smaller maps and the two levels of detailed maps, I have worked with the high resolution scanned image, with the reductions in resolution applied as the final stage, to create files of reasonable size and images of high quality. This and the subsidiary documents and images have been prepared primarily for the use of students in the courses which I teach, but may be used for any legitimate educational purpose by private individuals and students. Commercial reproduction is specifically prohibited.